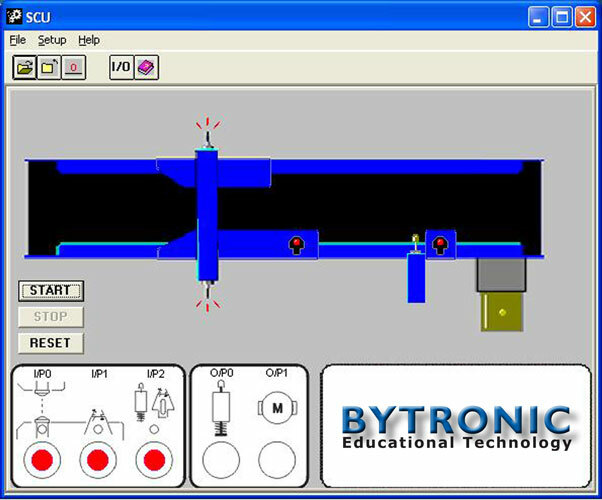 The Single Conveyor Unit (SCU) has been designed as a representation of a conveyor system used in the manufacturing process to allow the study of control methods used at an introductory level. The unit is based around a common application found in industry of sorting items as they travel along a conveyor system. The unit consists of a belt conveyor driven by a 24V d.c motor with sensors and an actuator situated along its length. Two different sized metal boxes are placed in turn at the start of the conveyor and as the box travels along the conveyor it enters an area consisting of two sensors that determines the length of the box. At the end of the conveyor is a sorting area with a sensor and linear solenoid. In the sorting area, the sensor detects the box and through the program controlling the single conveyor, the box is either accepted and allowed to continue or rejected, and ejected by the solenoid. Connection to a PLC is through two 24V d.c D type connectors and 24V d.c 4mm colour coded shrouded sockets. The PC can be connected using a suitable interface card connected to a 26-way IDC connector with TTL.